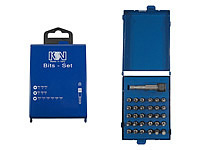 Bit-Set in a plastic box with belt clip. 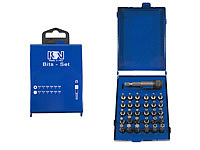 -high quality chromium molybdenum vanadium steel. 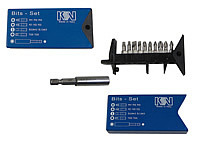 1 compatible bit holder, magnetically, 1/4"
Bit-Set in a plastic box with Beltclip. 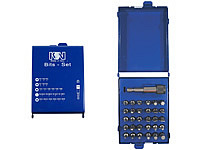 Bit-Set in a magnetic, extremly tough metal cartridge with quick change bit case. 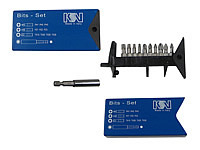 -1/4"-Bits professional version -high quality chromium molybdenum vanadium steel. 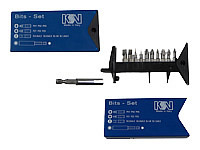 Bit-Set in magneticallyer, extremly tough metal cartridge with quick change bit case. 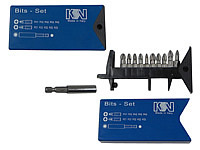 -1/4"-Bits professional version -high quality chromium molybdenum vanadium steel.